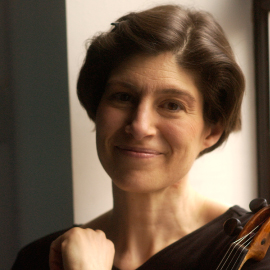 Born in Detroit of Armenian descent, chamber musician and viola soloist KIM KASHKASHIAN has been featured on over 30 albums, and her repertoire, which ranges from Bach to pieces by contemporary composers, constantly explores the versatility and emotional range of her instrument. She has done interpretations of many classical composers, including Britten, Penderecki, Hindemith, Shostakovich, Schumann, Brahms, and Bartók, among others, while recording for the DGG, Sony, and ECM labels. Kashkashian has formed an ongoing collaboration with pianist Robert Levin, percussionist Robyn Schulkowsky, and harpsichordist Robert Hill, and her versions of Brahms sonatas, done with Levin, won the 1999 Edison Prize, while an album of various concertos by Bartók, Eötvös, and Kurtág won the Cannes prize for chamber music in 2000.